Hong Kong’s shortage of affordable housing is becoming an increasingly pressing issue – over 30% of the population is currently living in subsidized housing, and the number of people waiting to enroll in the public housing program is growing each day. Because the Government program is so competitive, many residents are forced to live in divided units, cage homes, or rooftop settlements. Increasing rent pressure, inflation, and undesirable living conditions make homelessness the only option for many. Hong Kong is a rich city, but wealth is extremely unevenly distributed. According to a study on 28 Asia-Pacific cities, Hong Kong ranked the lowest on its Gini Index – a measurement of income distribution. While the rich enjoy luxury condos with elevated swimming pools, the poor, which makes up about 20% of the population (a total of ~1.4 million people), struggle with ever-increasing housing prices. 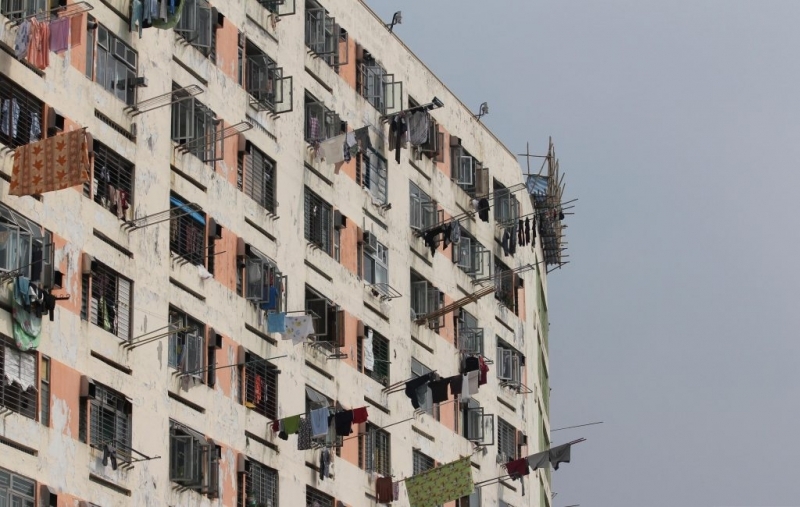 “One in three of Hong Kong’s population, over 2 million people, rely on subsidized housing. Waiting time is on average 4 years. Almost half of the population in poverty are working poor.” These are just some of the alarming statistics published by Hong Kong Housing Authority. Although the Housing Authority operates 740,000 flats in 172 Public Rental Housing (PRH) estates, the high demand for affordable housing is not close to being met. As of December 2015, there are nearly 300,000 applicants waiting for an affordable place to live in, and the number is only going up. As a result, people who cannot wait are forced out onto the streets. Although homelessness is commonly associated with unemployment, there is a large group of people are in the labor force also suffer from the effects of poverty. In Hong Kong, this “working poor” group accounts for more than half of the population in poverty. In numbers, that is about 700,000 people from working families who cannot provide themselves with basic living needs. The picture is clear: Hong Kong is expensive, and housing is a huge expense for most people. Price-To-Income (a basic measurement for housing affordability) in Hong Kong is almost double that of New York City (35.8 in HK; 19.5 in NYC). What can low-income residents do? Some have the patience to wait in extremely inhumane living arrangements until the day a public housing spot opens up: some build shelters on others’ roofs, and some spend their nights at McDonald’s as McRefugees. Most of them live “creatively” day-to-day, because they have no other choice. How can Hong Kong provide sufficient housing for everyone? Although the Housing Authority promises to build more subsidized housing, the current lack of supply calls for swifter action. The problem boils down to supply vs. demand in the number of affordable units. There is simply not enough supply of affordable housing in Hong Kong. When housing is scarce, it becomes unaffordable. Market-rate developers have the upper hand in this game. If the market allows them to build high-end housing and charge the highest rent they can get, they will. With this in mind, government should look at ways to engage these private developers in delivering affordable and mixed-income units. Given the lucrative high-end real estate market, this might seem like an empty promise. However, effective incentives for mixed-income units will work, and it is proven to be cheaper and faster than relying on public estates to be built by the government. For example, the Low Income Housing Tax Credit (LIHTC) in the U.S. has accounted for 90% of the country’s affordable housing by incentivizing private investors/developers to build low income units. In addition to providing incentives for low-income housing, encouraging the revitalization of underutilized properties in the city could also help increase land use efficiency, which will eventually drive down housing prices. There are many vacant industrial buildings in Hong Kong. However, the opportunities to re-purpose these spaces are limited due to zoning restrictions. Most of these parcels are zoned as Unspecified Use Area, which is ironically the government’s scheme to make land-use more flexible. In reality, such a flexibility clause does not make conversion of underutilized properties easy. In fact the complex application procedures and high waiver fees associated with building use conversion make it more appealing for landowners to demolish the old buildings and build anew on these parcels. As a result, most developers choose to build premium estates to target the more profitable markets. If these rules are relaxed and processes reduced, more underutilized properties could be re-furbished and re-purposed to add to the supply of affordable living spaces. Instead of solely counting on the Housing Authority to realize affordable housing construction in its the pipeline, we could leverage other approaches to relieve Hong Kong’s housing pressure. While the under-served get creative with their living arrangements, the government should also get creative in solving this housing crisis in a timely manner. May - In the US, people are moving South.This has exacerbated the inequality problem.